Congratulations to architecture and design collective Assemble who have been awarded Britain's leading contemporary art award, The Turner Prize, for their Liverpool housing scheme, Granby Four Streets. The winning project is an ongoing collaboration with local residents and others in Granby Four Streets: a cluster of terraced houses in the Toxteth area of Liverpool. The project is a result of a 20 year battle by local residents to save these homes from demolition. Assemble worked with the community to present a sustainable vision for the area. Assemble – a London-based collective of 18 architects and designers – counts among its members Mathew Leung a 2012 graduate from The Bartlett School of Architecture's March Unit 17 and a RIBA Dissertation Medal winner. 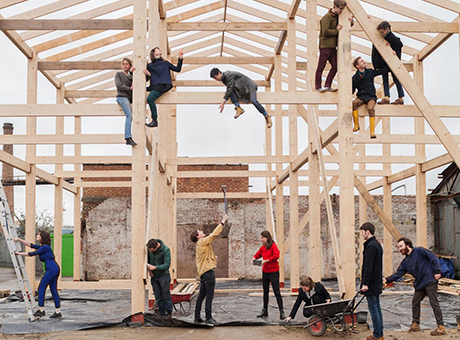 Assemble are the first collective to win and with an age range of 26 to 29, they are also the first architecture studio to ever win the Turner prize. This year’s Turner Prize exhibition is being held at Tramway, Glasgow until 17 January 2016. It is the first time the Turner Prize has been held in Scotland.